Established in 1983, Mineweaser & Associates is a full service architectural firm specializing in the preservation and restoration of historic buildings. We typically use the State Historical Building Code and the Secretary of the Interior Standards to successfully restore, rehabilitate, or remodel buildings that may have local, state or national significance as historic structures. 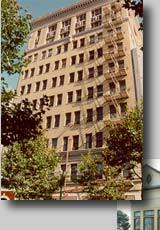 Many of our buildings are on the California or National Register. Copyright © 2000-2010 - All Rights Reserved.